The Ultra Beam antennas use length-variable elements made of a perforated beryllium copper driven in and out by a sprocket of a step-motor. A microprocessor-based controller forms any desired length of the beryllium copper strip into light but UV- and weather-resistant telescoping fibreglass poles. Very high quality fibreglass makes the hollow, light-weight fibreglass support element extremely durable and reliable under any weather conditions. Furthermore, a couple of sliding contacts made of beryllium copper provide a contact surface of at least 10 mm/2 which makes these antennas very reliable at very high power. Very long-term tests allow us to guarantee our antennas for many, many years of operation. The best material available in the Italian, German and United Kingdom markets have been chosen for the mechanical construction of the boom and any other antenna accessories. 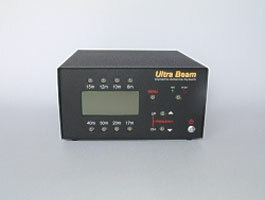 All antenna parts are assembled and tested exclusively by Ultra Beam. The boom tubes are made of 6082 T6 aluminium type chosen for its very good mechanical characteristics which is by 40 % superior to the custom aluminium and even by 10% superior to the well-known 6061 T6 Type. A double-boom has been adopted for the 4 element antennas. This system increases significantly the torsion-resistance by very little additional weight. The mast to boom plate is made of solid pre-drilled 6 mm inox steel. The best weight to mechanical resistance ratio has been achieved through a special design. Antenna- and step-motor housings are made of high quality ABS with an extra UV resistant PMMA coating! For this reason, driven-element motor-units use a 2:1 Balun to transform the 50 Ohm impedance of the feeding-line (coaxial cable) to 25 Ohm to be presented at the feeding-point. For the construction of a very reliable Balun, Ultrabeam hs adopted one of the many projects made by the famous Jerry Sevick (W2FMI) who was and still is, a world-wide reference in the field of transmission-line impedance transformation .The schematic of the Balun requires a special coaxial cable with an impedance of 25 ohm, adequate section and insulation. 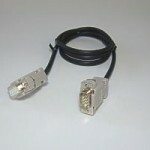 This is the reason why we do not use commercial coax cable and wrap it by hand in our laboratories. The toroid used is an excellent AMIDON with highly reliable permeability characteristics. Each hand-made Balun is tested by means of a special UltraBeam produced 25 Ohm dummy load, capable of withstanding a continuous power of 10 kW. Baluns are tested at a much larger power than that reported in our antenna features. Example: a simple “five and nine” can be exchanged without problem with a power of 5 to 6 kW in the SSB or CW modes. Instead for RTTY transmissions or CONTEST, is necessary, use one power less than 3500 Watts, this impose a combination of the common sense and good technical knowledge , in relation to high powers in full-time which always distinguish the good radio operator. Ultra Beam introduces the VRS. 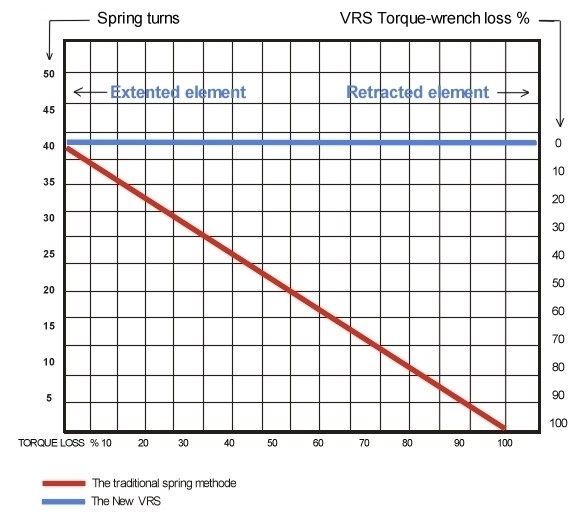 VRS features a unique and effective tracking system with variable mechanical pitch. The VRS system, designed by Ultra Beam, allows the drive motor to work perfectly even if the copper tape has been bent. The old motor unit, with recovery spring, is not able to do this, but will inevitably get stuck. After having chosen the most reliable and superior mechanics ever used in a Dynamic Antenna System, Ultra Beam’s VRS is the latest and exclusive mechanical and technical achievement of ultimate reliable Element Housing Unit (Motor Units) never seen in any Dynamic Antenna System before. In order to convey the upmost reliability to its antenna, Ultra Beam has always used the best materials and the best technical solutions intended for no-compromise operations particularly in the case of a Dynamic Antenna System. 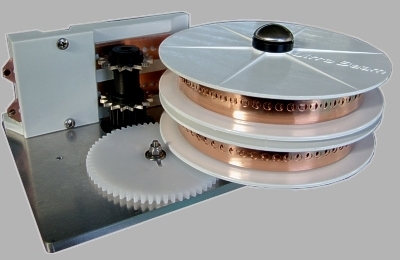 Torsion-spring in the spools to perform a constant feeding and adherence of the Copper-Beryllium tape around the two spools during the driving -in or -out of the antenna elements. The main problem in defining the design of our revolutionary VRS has not been its gear-case and dimensions, but the system that compensates for the variable peripherical speed of the copper-beryllium spools. As the step-motor is the only tractor, speed compensation is necessary to make the spools track in order to allow them to track impeccably in accordance with the length of Copper-Beryllium tape which inevitably varies as it is driven along the fibreglass element supporting tubes. In fact, as the Copper-Beryllium tape is collapsing or retracting, the diameter of the spool will diminish or increase respectively. The most reliability-demanding Hams will welcome the VRS as the only device which will make Ultra Beam the true reliable single-tower HF Dynamic Antenna System ever seen in the International Amateur Radio Service. Ultra Beam antennas will continue to be not only the best antennas for today’s and future Radio amateurs but, primarily, it will be the only dynamic antenna without torsion-springs for many years to come. The revolutionary Variable Reeling System (VRS) is only the latest step-up which makes Ultra Beam antennas unquestionably the best among any Dynamic Antenna Systems. 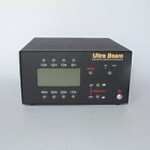 Ultra Beam will always remain the only company which will continue to give priority to high quality and reliability. 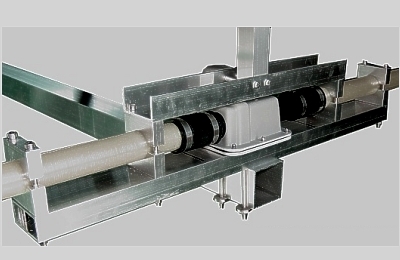 Ultra Beam presents you the new fibreglass telescoping tubes used in the new antenna production starting from May 2010. 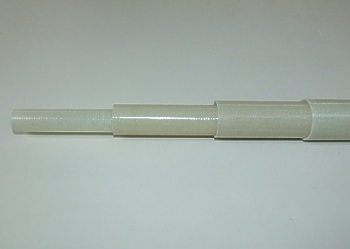 The ivory colour of the new fibreglass telescoping pole makes the antenna much less visible under particular light conditions and over a certain distance. For the observer the visual perception of the antenna elements is extremely reduced. This is very important for those Hams who have particular antenna installation restrictions. 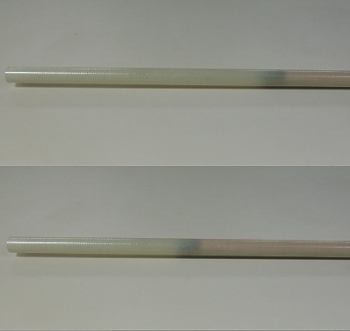 The transparency of the new fibreglass telescoping poles allows the movement and the position reached by each copper-beryllium strip to be observed easily. This enables an immediate check of the correct performance of each Motor Unit, but it also allows you to better understand how the antenna works and to see its various yagi-configurations on each band and mode. 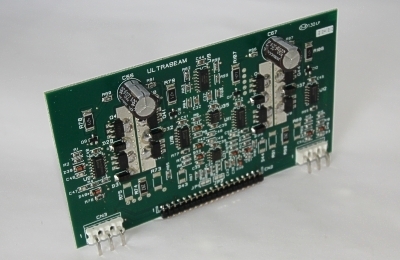 The heart of an electronically controlled antenna is its dedicated controller. 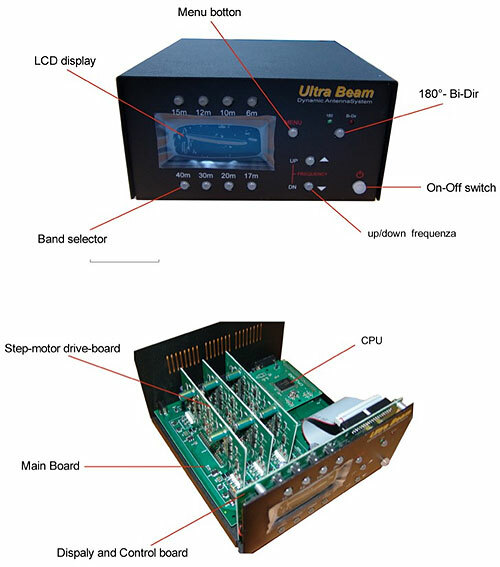 When designing it, Ultra Beam’s main objective was to develop the most reliable electronics, which has been achieved by over-dimensioning each component. 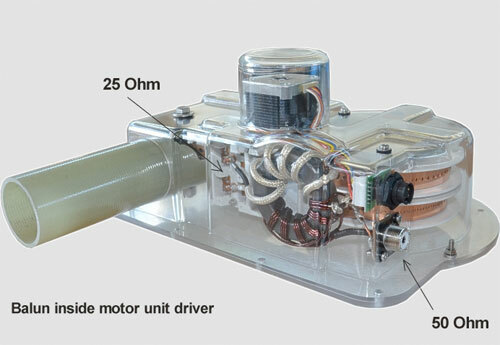 The “ad hoc” driver for each step-motor uses a very reliable transistor-bridge. Each driver’s peak-current of 10 Amps allows an extremely reliable function of each step-motor even under accidental short-circuit condition and severe electrostatic conditions. A much cheaper material could have been used to drive the step-motors, but this would have made it significantly less reliable. Each driver’s operating parameters such as chopper current and frequency, half- and full-step are fully linearly controlled by the CPU. 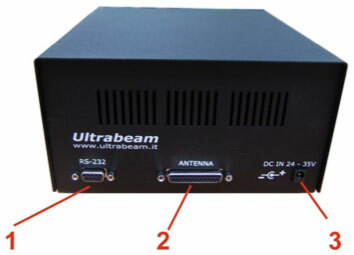 Ultra Beam has made every technical efforts in developping the controller of our antennas. We consider the management of an electronic-controlled antenna to be its most important aspect. The four drivers use a total of 32 transistors of which 8 are used for each driver, instead of the common and delicate chips normally used to drive step-motors. We have taken particularly care of its design by adopting a graphic LCD and luminous push-bottons which confer a particular “look” to the controller. 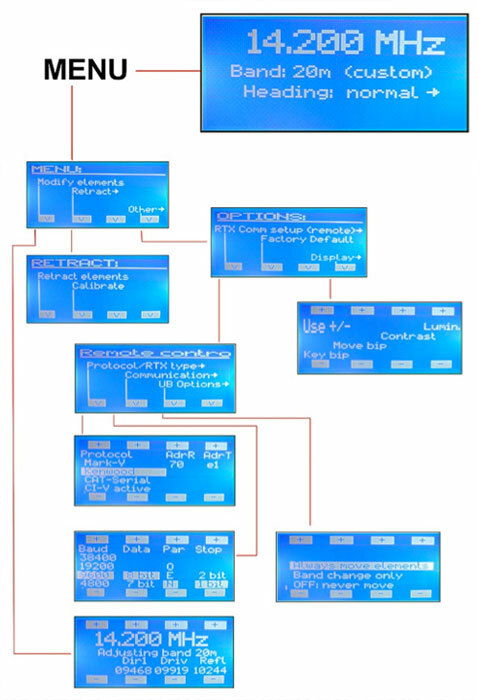 The software has been studied to be as simple as possible to the operator. The extremely intuitive graphic interface allows you an immediate operation of your antenna without the need of reading its instruction manual. Possibility to have the four element-lengths displayed contemporaneously and see real-time length- modifications. This is particularly useful to have a total vision of all element-lengths if you should desire to modify their lengths in accordance with any Yagi design programs. 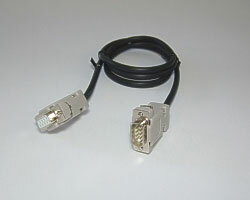 RS 232 for future PC connection. Very reliable short-circuit and electrostatics protection. Visual signal and audio bip while elements are moving. Automatic calibration in the event of any power supply failure during the modification of element-lengths. Variable contrast of the the graphic LCD and push-bottons dimmer. The stop-current is independently generated for each motor by a very stable current generator in compliance with the step-motors. 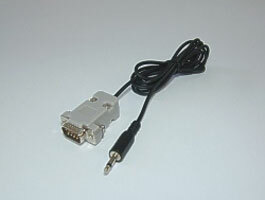 RS-232 : firmware up-grade and interface to RTX. DB-25 : connection to Motor Units. Well aware that the most effective dynamic antenna system can only be possible primarily through the effectiveness of its dedicated antenna controller, major priority has been given to utmost performance and reliability of this very important device. This is well evidenced by the discrete components used in lieu of common and, consequently, cheap integrated circuits. Each Motor Unit, in fact, is driven by a very reliable driver-board equipped with eight transistors capable of handling 10 Amps in case of accidental short-circuit. 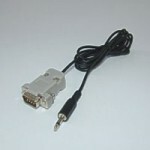 The RS-232 port permits to upgrade the firmware for free at any moment. 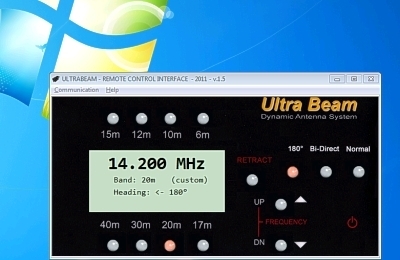 You can download the latest upgrade from: http://www.ultrabeam.it/download1.html by simply connecting a pin-to-pin serial cable between the Antenna Controller and your computer. Furthermore, you can use the RS-232 port to interface your RTX to the Antenna Controller. By a dedicated cable (optional) your antenna can now track the frequency you tune on on your RTX. By entering the Menu, you can also select either the Band-Switching or the Band-&-Frequency function. While an easy and very intuitive software interface permits anyone to use the Antenna Controller without the need of reading its Instruction Manual, its large LCD display shows each Menu-page and its related functions. In accordance with the antenna-type (vertical, rigid-dipole or yagi), an appropriate software will be installled in the Antenna Controller. This will permit the antenna element (in the case of a vertical or a rigid-dipole) or elements (in the case of a yagi) to reach the default lengths for perfect resonance on the operating frequency. In most cases, however, the owesome 50 Ohms impedance necessary to obtain an SWR of 1:1 can only be obtained by slightly modifying the default lengths (normally by very few centimetres) of the driven element. You can perform this operation within a couple of seconds only and while sitting confortably in front of your radio equipment. Once the operation has been completed, the CPU can now store the optimized length for ideal antenna-resonance on the whole antenna operating range. The time necessary to band-changes is very short. When starting from its fully-retracted condition, the antenna only needs 18 seconds to reach the due length on the 20 metre-band. Apart the shorter time needed to switch from an operating band to another, the movement of the antenna is signalled by a bar-graph, a flashing band-led and an acoustic signal (bip) you can either switch-off or adjust through the Menu. New Motor Units use now a very exclusive and performing mechanics. Motor-Units unquestionably durable and highly reliable under any weather conditions andThrough the years. All UltraBeam antenna-elements consist of a motor Units and two sections of hollow fiber Glass elements support tubes where the Copper-Beryllium strips are driven out to form the Desired lengths of each antenna element. The decreasing thickness of each fiber glass tube has permitted to reduce the weight of each half-element to 970 grams only and bestow extra flexibility and strength. About 100mm of each half of the fiber glass elements support tube Will be inserted in the fiber glass tube of the Motor Unit tube. As rubber boot blocks each half element in its position and seals the Junction point. Motor Units are so perfectly waterlight that no extra sealing is necessary. Each half element is made of our conical fiber glass sections. The mechanical strength at each boom-joint point is even stronger than any other point across each boom-section. This unique joint system gives the boom the same mechanical stability as if were made of a Single length. The 3 element 6-20mtrs antenna models do not need a truss and the remaining models are provided with very effective trusses made of 6mm MastrAnt line. * One of the diameters has to be specified in the order. ** To be specified in the order. You can install your UltraBeam very easily, quickly and,above all, without the need of reading useless pages and pages of installation instructions. The exact positions of each Motor Unit is indicated by coloured labels on the boom. Each Motor Unit is fixed on the boom by 4mm aluminium plate. Motor Unit plates are fixed by four M6 bolts and two stainless plates (stirrups) on the bottom side of the boom. This effective method avoids to perforate the boom and,aboveall, it guarantees that the Boom-plate remains firmily fixed to the boom. 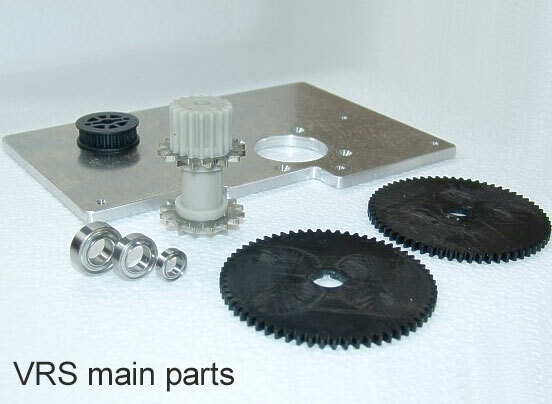 All Motor Units are fixed to its aluminium support plate by eight stainless M5 bolts. As all nuts are self-blocking,just tighten each bolt untill a light pressure is noticed on the gasket. Do not over tight. Unlike the Motor Units for the passive-elements, the Driven Element Unit is provided with is an efficient 2:1 Balun (25-50 Ohms). As the typical antenna impedance is 25 Ohms, a Balun is essential in order to have a perfect match (SWR 1:1) between the antenna and its the feed-line. Motor Units used in each passive-element are indicated. Although they are distinguished by coloured labels they are perfectly identical both eletronically and mechanically. The presence of a multi-pin IP68 panel-socket on every Motor Unit makes its removal extremely speedy and confortable in any moment. All connectors are perfectly waterproof and do not need any extra sealing. UltraBeam does not recommend any extra sealing materials. IP68 connectors used in the Plug-in Antenna Control Wiring Cable permit a quick connection between the Antenna Controller and the antenna. You only need to insert each IP68 connector to its related Motor Unit, the DB25 Connector to the Antenna Controller and your antenna is ready to be used. 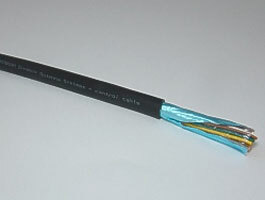 Each Plug-in Antenna Control Wiring Cable is made and tested by UltraBeam. For this reason the control cable is delivered with the DB25 connector soldered to its end. If removing the DB25 is necessary to get the cable to your radio-room, be careful when taking note of each coloured wire and its related pin-numbers. 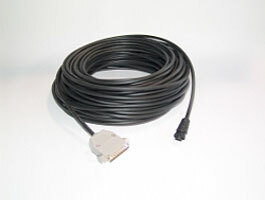 To avoid any mistake we suggest to cut the cable a few centimeters from the DB25 and re-solder the wires one by one. Unsolder one piece of wire from the DB25 connector and solder the wire with same colour to the same pin. Repeat this operation for each wire of the control cable. 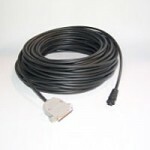 The connection wiring between the antenna control cable and each four-conductor cable from each Motor Unit is made at the UltraBeam factory and sealed by a special “Y” thermo-shrinkable material. This connection between Motor Units and control cable is perfectly watertight and no extra sealing is necessary. 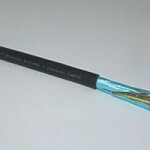 As each control cable has its own length, you only need to lay each cable along the boom and fix by tape or tie wraps. Each connector is marked by a colour, therefore, the connections are both easy and inequivocable. Connector are the excellent IP68 made in USA by SwitchCraft. As these connectors are absolutely watertight at and temperature and weather condition, UltraBem does not recomment to use any sealing material either on the connectors or on any part of the Motor Units. Although each Motor Unit is accurately tested at the factory, we highly recommend you to carry out an electrical check to verify that no damage has occurred during transportation. Switch ON the Antenna Controller and wait until “ELEMENT RETRACTED” is displayed. Press “MENU” and confirm by “YES” (30m button). Press again “MENU” to retract. Elements used by Yagis antennas operating in the 7-50 MHz range are about 21,5 meters long. For these types of antennas UltraBeam has designed an adequate and very reliable element support mechanics. Elements are not supported by the Motor Units, but simply by a very strong aluminium structure fixed on the boom. Unlike the 6-20mtrs types, the only task of the Motor Units used for the 6-40mtr antennas is to drive the Copper-Beryllium strips along the fiber-glass tubes. As each element supporting structure is the only part in charge of holding up the whole weight and the mechanical stress of the related antenna-element (Motor Units are not involved with any mechanical stress), it makes the removal of the Motor Units extremely easy and speedy. The unique boom-to-element support system, designed and developped by UltraBeam, gives you the possibility to assemble each antenna-element on the ground and fix them very confortably to the boom successively. This important possibility, at times, becomes particularly decisive when space is very limited. Each half antenna-element (Left and right) consists of three pieces: a fiber-glass telescopic tube (1) (also used on the 6-20mtr yagis) and two 2,7 mt cylindrical fiber-glass tubes. The fiber-glass tubes are joint together by a short stainless-steel tube also used as an anchorage point for the vertical Trusses (furnished with the antenna) of the antenna elements. UltraBeam vertical antennas use a single Motor Unit and a vertical telescopic fiber-glass tube. 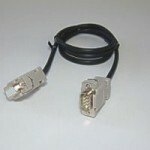 Both antenna types operate as full-size 1/ 4 wave lambda on any frequency. Unlike rigid dipoles or Yagis, the impedance is determined by the ground (radials). Radials must be made of copper wires and have a length of 1/4 lambda on each operating band. Remember: the more the radials, the higher the efficiency of the antenna. The Motor Unit will be fixed to a aluminium tube (delivered with the antenna) provided with a lathed bush. The aluminium tube is 1 meter long and can be installed anywhere. 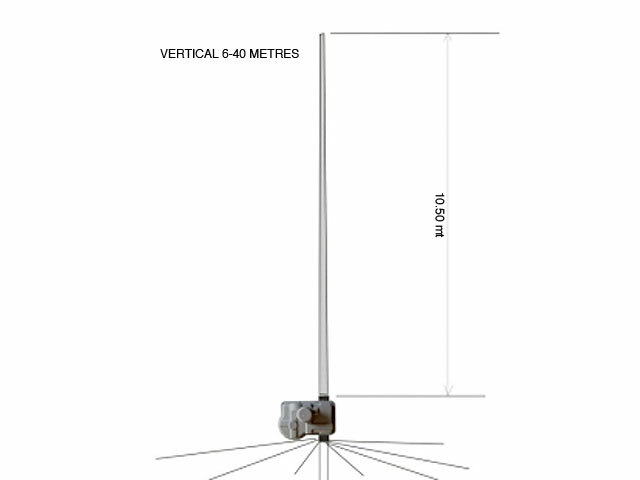 The 6-20mtr vertical antenna can be assembled and installed very quickly because it has a single 5,4 meter telescopic element and therefore no guys are needed. sections and its total length is slightly over 10 meters. This antenna needs one set of 4 guys anchored to its middle. The guys can be made t of 3-4mm nylon strings or any other non-conductive material. The element is e provided with a fifth wheel to anchor the set of guys. 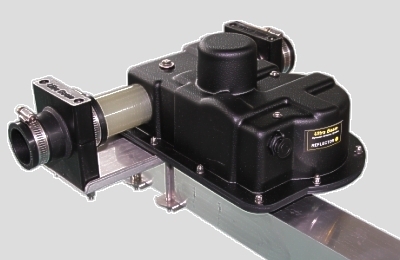 equipped with the Variable Reeling System (VRS). antennas, but equipped with a single Drive-Board and a dedicated Software. The best transfer of the RF power in the Aether (maximum antenna efficiency) is guaranteed by the perfect resonance of an aerial on its operating frequency. Many Hams erroneously still believe that a condition of 1:1 Standing Wave Ratio (SWR) indicates the perfect resonance at the operating frequency. It must be remembered that this ideal SWR condition tells us that the impedance at the antenna feeding-point is equal to the feed line impedance (normally 50 Ohms). Traditional fixed-length yagis present their best resonance only on a specific frequency of its operating-range and a specific fixed band-width strictly depending on the operating frequency and the diameter of the antenna element. To make a long story short, let’s take an example of an antenna resonant on 7,100 MHz. If we gradually increase the operating frequency, the antenna will gradually show an increasing inductive-reactance (Zin + Jin). Therefore the antenna will gradually become longer and longer at each new operating frequency. If we gradually decrease the operating frequency, instead, the antenna will show a gradually increasing capacitive-reactance (Zin – Jin) because it will gradually become shorter and shorter at each new operating frequency. When we start getting higher or lower than 7.100 MHz, the values of the remaining parameters will begin to become less and less ideal. If we take a look at the phase (comparison between Current and Voltage) we see that, inevitably, it will change the ideal value as we operate either higher or lower than 7.100 MHz. The final result will be an inevitable discrepancy around the ideal 50 Ohms. We wanted to write these very few and simple lines to introduce you to a series of graphs to show you how the parameters of a conventional length-fixed antenna do change in comparison with an Ultra Beam antenna when the operating frequency is varied. Please note that the measurements have been made on a full-size 40-meter monoband resonant on 7.100 MHz and a 6-40 meters Ultra Beam antenna. The graphs show the devastating difference between the two aerials as the frequency is varied around the reference 7.100 MHz. They show the drastic variations of values evidenced by the monoband while the Ultra Beam shows almost unappreciable changes along its operating range. The difference between the two aerials is so big that if we wanted to represent all parameters on a single graph, those relative to Ultra Beam could only be represented by very flat lines. If this does not make Ultra Beam magic, it certainly shows that it is the closest ever antenna to the theoretical one treated in the antenna-manuals. We hope that our new way to introduce the above arguments and the prerogatives of an antenna that has the ability to be always perfectly resonant on each Kilohertz of its operating-range, may explain the reasons of the disarming difference between the performances of a conventional fixed-length antenna and ours. Every Ultra Beam owner, in fact, has already changed his own mind about the mythical monobanders. PLEASE NOTE: Please, pay due attention to the values represented by each curve. The two graphs below show that the resistance values of the monobander range within 85-100 Ohms while the same parameter of Ultra Beam ranges within 50,3-50,8 Ohms in the whole range 7,0-7,2 MHz. The two graphs above show the very large differences between the two antennas. 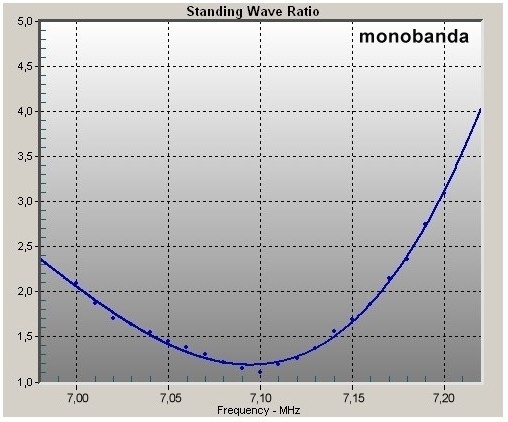 The graphs show that the values of the monoband antenna change very drastically if compared to those of the Ultra Beam. 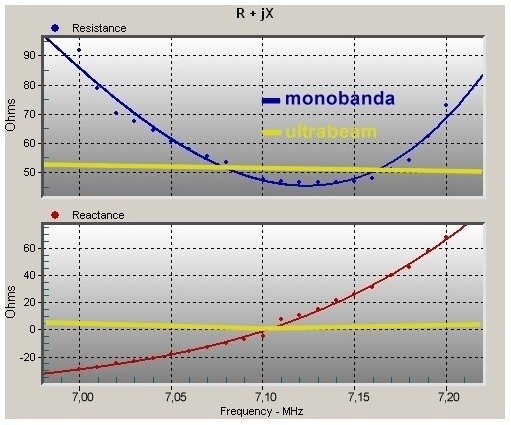 The difference between the two antennas is so large that, if we would lay the graphs of the Ultra Beam upon those of the monoband antenna, all parameters could be represented by a horizontal lines only, as if it were a true theoretical antenna. 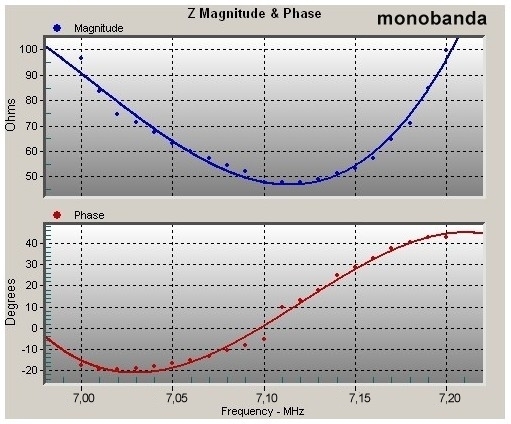 The software we have used did not permit two antennas to be “plotted” simultaneously, but a “manual” overlap will show us two graphs which represent a very disarming difference between the Ultra Beam and the monoband. The yellow lines show the ideal values of Ultra Beam within the entire frequency-range represented on the graphs below. 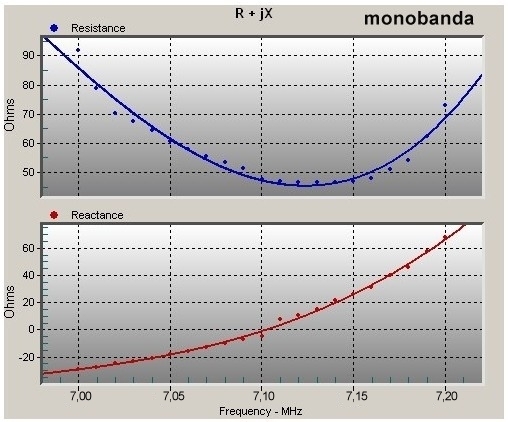 The best “Resistance” and “Reactance” values of the monoband antenna are contained within an incomparable limited frequency-range. These differences, of course, are much bigger if we compared our antenna with any “trap” antennas. We are sure that our “unusual” way to explain the true importance of an effective resonant antenna will enable you to better appreciate and understand that the advantages of Ultra Beam over a conventional length-fixed antenna are not limited to the possibility to reach the faithful 1:1 SWR only. 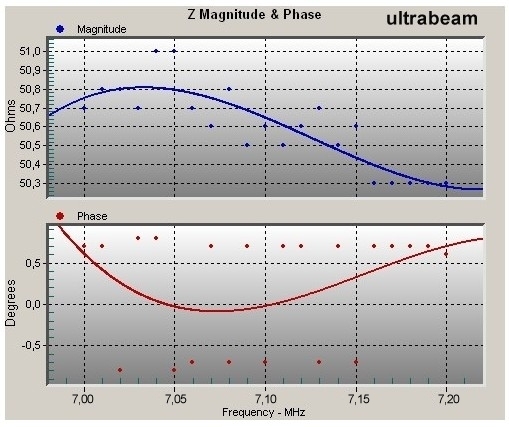 Ultra Beam wanted to make a comparison with a monoband antenna because such an antenna is STILL considered the best performing antenna by many Hams world-wide. 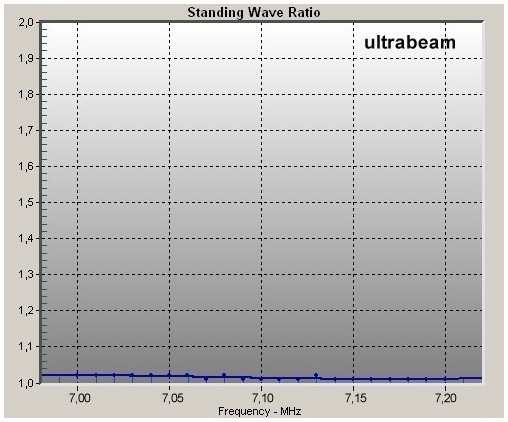 We want to remind you that the Ultra Beam used in the tests shown above has shown the amazing “flat” response independently of the operating frequency within 7,000 – 28,000 MHz. Its performances have shown to be better than 7 monobanders designed for each of the actual 7 international bands comprised in its operating frequency-range. Last but not least Ultra Beam is a true general coverage antenna in its entire operating frequency range. This short video shows the main steps to assemble an UltraBeam Yagi 2 elements 6-20. Though this video refers to a specific model can be used as reference for all the Yagi 6-20 models ( elements length 5,4 m). The sequence refers to one element only, you can duplicate as necessary for all the other elements. This new initiative is an important contribution that shows how quickly and easily you can assemble your Ultrabeam. 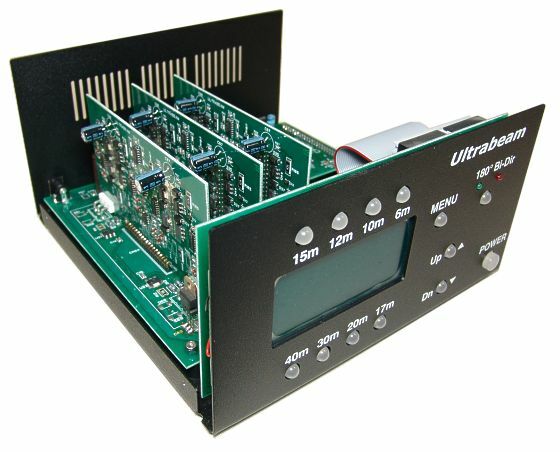 PstRotator has launched a new release that includes a new software v.7.12 Management Controller Ultrabeam. Use of this software is useful for the automatic antenna through the various electronic LOG. Naturally, the same application can be used for the management of the rotor UB-ONE.